scrimpingmommy: Easy decorated treat pot gifts. Easy decorated treat pot gifts. I love anything I can gift sweet treats or small gifts in. I love even more when its partially ready made for me so all I have to do is make it look pretty. So much quicker and easier than making EVERYTHING from scratch when you need to save time. 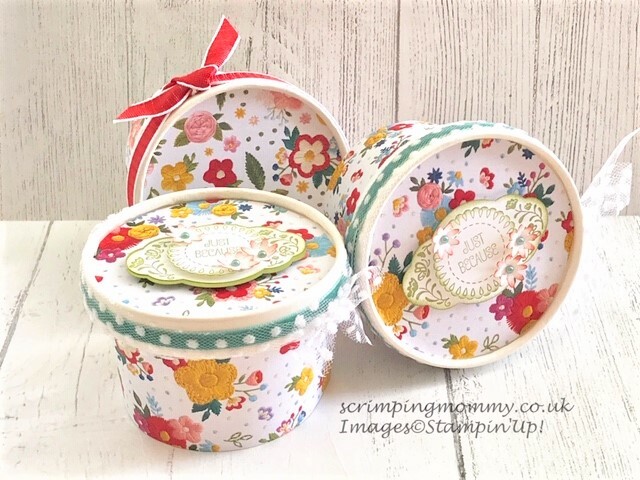 The Sweet Cups from Stampin' Up! are an awesome pre made treat or gift holder you can just decorate and be good to go. Here is how mine turned out.. I love how these turned out. And I love that I was able to just play and decorate rather than have to make a whole project from the beginning … wow it saves so much time. You can dress these up however you like. I chose to use the Needle point nook designer series paper on mine to give a cute floral look. Layering with velvet ribbon and tulle to make it look super pretty. My sentiment comes from a good day and this pairs up perfectly with the Pretty labels Stamp and Punch bundle. Finished of with some tiny flowers made using the bitty blooms punch set and artisa pearls. Fill with your gift or sweet threat and your away. These come in a set of ten and are quite reasonably prices so great to have a box or two to hand for quick gifts. I do have a step by step tutorial for you to follow which includes instructions on creating your own template to cover the cups. So grab a fresh cuppa, get comfy and enjoy the video. I have listed all the items used for you below if you wish to view and purchase simply click the product photos.